Water that melted from ice and snow carved channels through a Martian gully and deposited a fan of mud at its mouth less than 1.25 million years ago — a recent time when early humans were walking upright and making tools on Earth, suggests a new study. 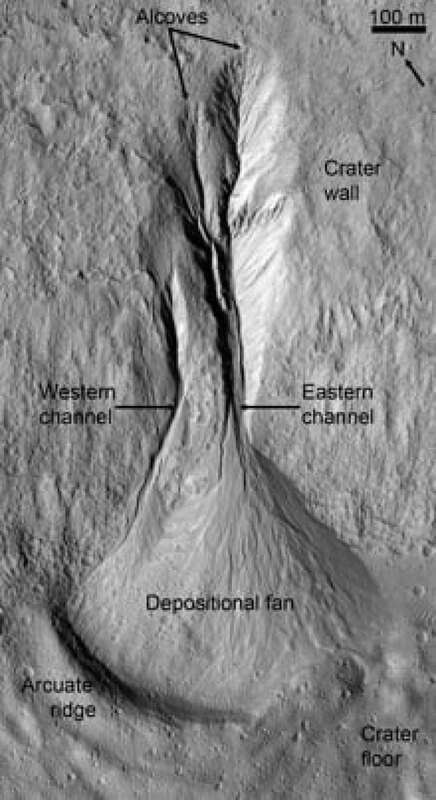 Channels in the fan-shaped mud deposit suggest it wasn't left by a dry landslide. ((NASA/JPL/University of Arizona))Water that melted from ice and snow carved channels through a Martian gully and deposited a fan of mud at its mouth less than 1.25 million years ago — a recent time when early humans were walking upright and making tools on Earth, suggests a new study. Previously, many scientists thought most water on Mars during that time period consisted of ice that sublimed directly into vapour and vice versa, with occasional bursts of liquid from groundwater sources, said Samuel Schon, lead author of the study. His work, published in the March issue of Geology, shows that doesn't account for the entire water cycle on Mars. "It's actually more complex," said Schon, a Ph.D. student in the geological science department at Brown University in Providence, R.I.
Schon's study focused on a gully in the Promethei Terra highlands in the southern mid-latitudes of Mars, which was imaged using a high-resolution telescope on NASA's Mars Reconnaissance Orbiter about a year ago. "There's nothing exceptional about the gully itself," he told CBCNews.ca Tuesday. "What's exceptional is that we can date it very well." Up until now, scientists have located many features on Mars that look like they were created by meltwater, and look similar to features on Earth formed by brief water flows due to melting in the deserts of the southwestern U.S. or some valleys in Antarctica. However, they weren't sure when those Martian features arose. Ph.D. student Samuel Schon based his study on images sent back by NASA's Mars Reconnaissance Orbiter about a year ago. 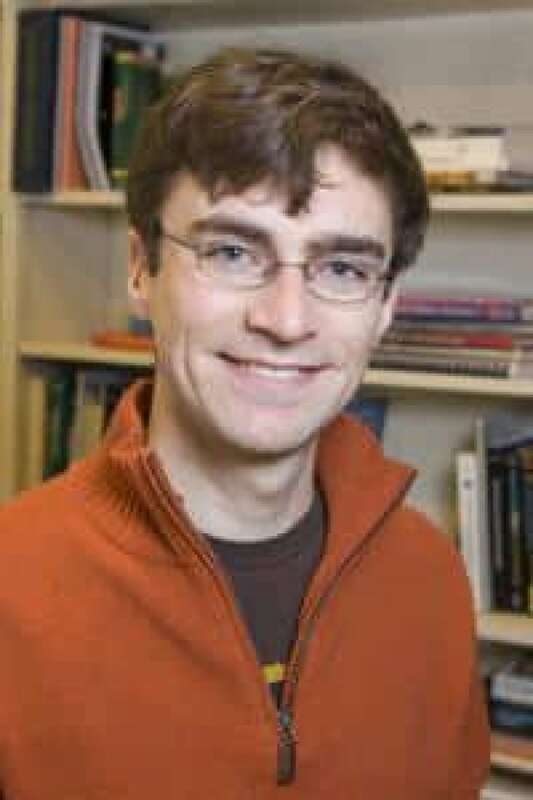 ((John Abromowski, Brown University))Schon used a crater-counting technique developed for dating features on the moon and later adapted for use on Mars. Large meteors that crash into the surface of a planet or moon leave behind large craters. The impact resurfaces the area around its rim, leaving it smooth and flat like a newly repaved road. Over time, random impacts by smaller meteors leave smaller craters on that surface, and it becomes more and more pock-marked as time goes on. By counting the smaller craters on that new surface, researchers can estimate how long the large crater has been there. The gully fan studied by Schon is located near a large, fairly young crater. Using the crater-counting technique, it was estimated to be about 1.25 million years old. When the meteor that left it crashed into Mars, a lot of smaller debris was also scattered by the impact, leaving smaller craters, which can be linked to the impact by their orientation and distribution. Some of those craters can be seen at the edge of the gully fan, and the images show that some of the mud was deposited over the cratered area. That suggested that water ran through the gully after the meteor strike that formed the main crater. Some of the deposits are cratered themselves, and others are smooth, showing that they were left at different times and that water ran through the gully more than once. Schon said that is further evidence that it was caused by meltwater and not an isolated upwelling of groundwater. In theory, similar deposits could have been left by a dry landslide, but channels in the deposits suggest that water was involved. Schon thinks that water likely flowed for a few hours to a few days. He believes the results of the study offer an important insight into Mars's past. "It's helping to sort of pull together our understanding of recent Mars climate for sure."